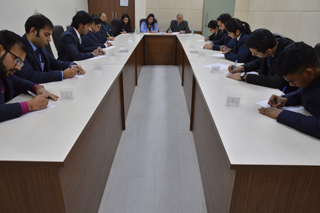 As a part of placement preparation, PGDM department organised a two-day Mock GD on 20th & 21st August 2018 for the students of Batch 2017-2019. Since Recruiters these days use GD based on caselets as a part of placement process, at JIMS, We ensure the students are trained on the same from time to time, so as to acquire and maintain proficiency. Each group consisted of 10-11 students while the panel comprised of three panelists. 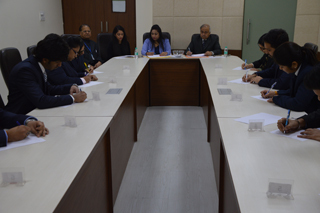 A quick overview on how the particular process would pursue was explained by the panel.The group was provided with the case lets, on the basis of which each student had to keep his or her view point , each panelist will recorded the observation. Once the discussion ended, overall observation along with an individual feedback were shared by the panel to individual students. The panel also focused on group behaviour and gave recommendation on polishing individual conduct. A few Case titles on which GD were conducted include: Cadbury’s Diary Milk to offer low sugar version ,Samsung Galaxy A phone launching in India, Danone on a health trip and The sad state of Indian Aviation. Mock GD sessions are beneficial for students. They help students to start practising early, to inculcate effective strategies, to improve their knowledge, to familiarise themselves with pressure, and act as a guide to move forward.